A call option is considered out of the money when its strike price is higher than the current price of the underlying security. A put option is considered out of the money when its strike price is lower than the current price of the underlying security. The key thing to remember with all options that are out of the money is that they never have any intrinsic value; the value of calls and puts that are out of the money is comprised mostly of time premium or theta. Note: Out of the money will sometimes also appear as “out-of-the-money” and “OTM.” Both variances of the term mean the same thing. However, “out-of-the-money” is most commonly used to describe an option, i.e. the out-of-the-money put. Whereas, “out of the money” is most commonly used to describe where an option is located, i.e. it is located at the money. 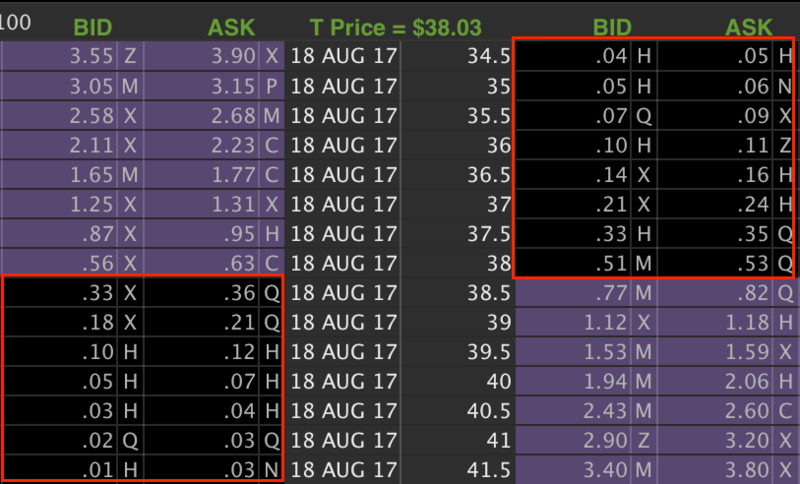 Every call option with a strike price greater than $38 is out of the money. Every put option with a strike price less than $38.50 is out of the money. This option chain shows the out-of-the-money calls on the left and the out-of-the-money puts on the right. Options that are out of the money are very important to active options traders. 99% of all options strategies involve trading options that are not in the money. When buying OTM options, the price is always less than options that are in the money, This equates to more leverage and the possibility for greater returns. Simply put, out-of-the-money options offer more leverage for buyers. With more leverage, however, comes an increased likelihood of expiring worthless. Due to the increased likelihood of expiring worthless, many traders prefer to sell-to-open call or put options that are out of the money. See more info about selling call options and selling put options. The flipside of this increased probability of expiring worthless is the aforementioned increased leverage for OTM options buyers. But since the increased leverage of OTM options works in favor of options buyers, it therefore has to work directly against options sellers. This is why selling options is considered “risky.” The maximum profit for selling options is always limited and the maximum loss potential is usually very severe. For out-of-the-money options in particular, the risk/reward ratio is often less favorable depending on the amount of premium received for placing the trade.